With the holidays around the corner it’s time check out new toys for the season! My son is 2 and the preschooler age is a fun one. He is just starting to get to know characters and his imagination is suddenly in full gear! The Super Friends HeroDrive vehicles are a great size for small hands. My son loves anything on wheels and he was drawn to the colourful cars and “faces” on them. 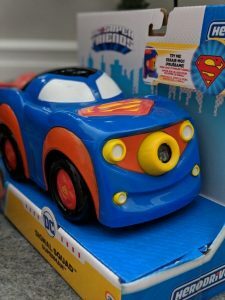 As a mom, I’m a fan of the style of these cars – typical superhero toys can be a little “dark” and feel too serious for such young kids. The HeroDrive cars are a great way to introduce the superhero world to the little ones. 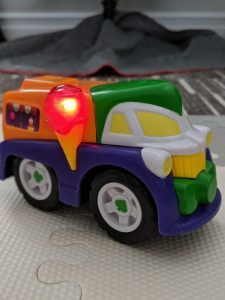 Each vehicle has a large logo that younger kids can easily push and initiate different lights or sounds. 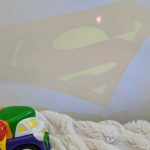 I particularly love the Superman symbol projection! T doesn’t quite know his super heros or villains just yet, but it’s fun to see him getting creative with the cars. 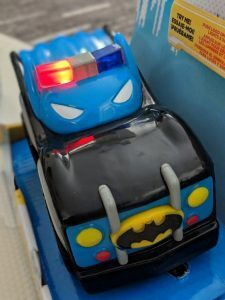 The bat mobile is a police car and the Joker car is apparently an ice cream truck! He also uses them to race the other cars he has in his collection and drives them all over the house; through tunnels (under the table) and over bridges (aka the couch cushions). 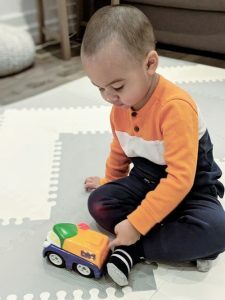 They’re a great addition to his imaginative play time and I can’t wait to see what other types of cars they become as he gets older. 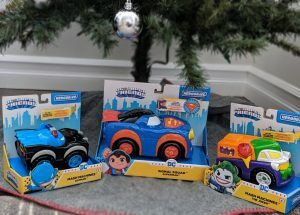 The Super Friends HeroDrive series would be a great gift for any budding super hero fan and preschool aged kid. sounds. Push the symbol on the front grill to start the action! Appropriate for ages 3 years and up. Batteries included. Collect them all! Light up the streets while chasing down the bad guys with HERODRIVE DC Superfriends Signal Squad! These free-wheeling vehicles feature the iconic heroes Batman, Superman, and The Flash. Press the logo on the hood to project each superhero’s signal! Which city in need will you save next? Collect all 3!